Businesses in Worcestershire are invited to a free, interactive event to help them identify and protect against the latest cyber security threats. 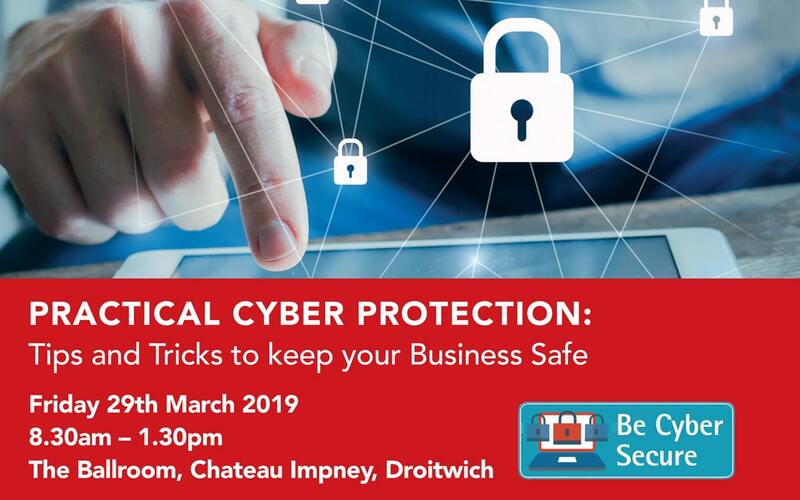 The morning event, held at Chateau Impney in Droitwich on 29 March, will offer practical tips and advice from technology and security experts, on preventing and dealing with cyber-crime. Businesses who want to reserve their place at this event are being encouraged to sign up at their earliest convenience, as spaces are limited. To book a place or find out more information, businesses should visit https://businesseventsworcestershire.com/events-search/details/?id=80. The Be Cyber Secure programme is funded by the European Regional Development Fund and supported by Worcestershire County Council and local District Councils. More information on the Be Cyber Secure Programme can be found on the Worcestershire Business Central website – http://www.business-central.co.uk/be-cyber-secure.